New thermal tube inserts that accommodate 12.5mm x 30mm, 1.5mL vials that will directly integrate with Hamilton carriers via base wells that align with carrier locator pins. Unit is SBS-compliant, provides direct surface contact with thermal nest for maximum heat transfer and has exterior insulation to sustain and drive temperature to all 24 vials. 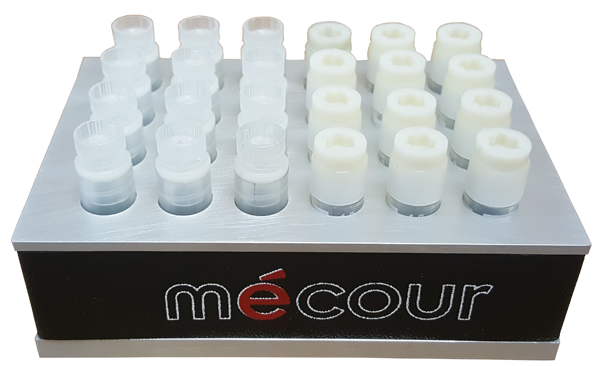 As shown, MéCour will provide these Inserts for different sized tubes or small vials in configurations that remain within SBS footprint specifications. Units can be integrated with most thermal nest devices and have a temperature range between -5°C to +100°C. MéCour Thermal Inserts afford maximum flexibility when application requires different tube and vial sizes necessary to support work flow.